Our Son. the Organist and the Funeral. Revisiting the old photos of the kids playing the piano, reminded me of a hilarious anecdote from my grandmother’s funeral when my 5 year old son spoke with the organist. Funerals are funny things because, although there’s the obvious grief and solemnity but they also end up becoming something of a party. After all, you only ever seem to catch up with this veritable melange of family, friends and the outer layers of the onion on mass at weddings and funerals. So, there’s usually not only the opportunity to reflect on old memories, anecdotes and photographs but also create new ones. Something to recount at the next wedding, funeral or even over Christmas. My Grandmother at the Australian Embassy in Washington, 1948. 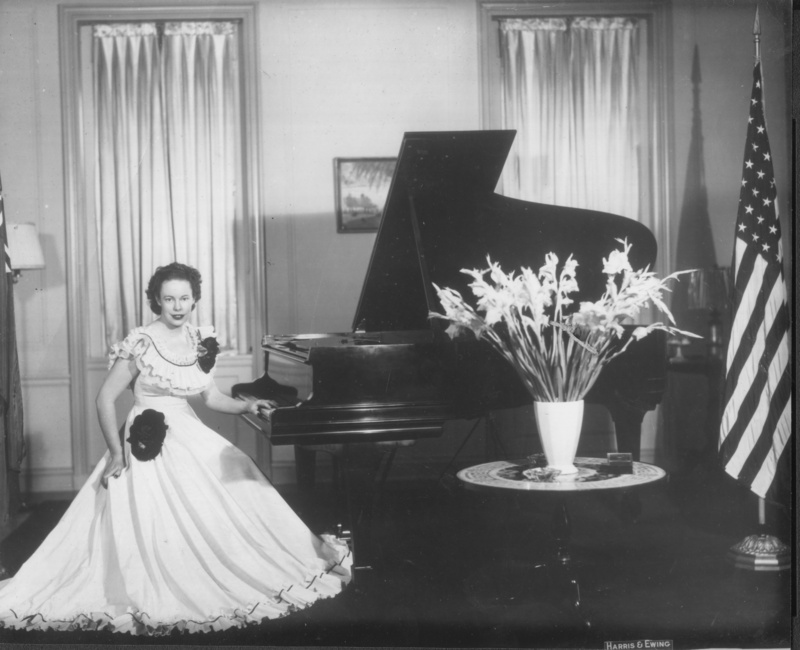 My grandmother, Eunice Gardiner, was an Internationally recognised concert pianist. So when it came to her funeral, my uncle arranged for Bernard Kirkpatrick, who had played the organ for the Pope’s Sydney visit in 2008 to play at the funeral. Although the funeral was only held at our family’s Parish Church, the organ had multiple layers of keys and really looked and sounded very impressive. This grandeur all culminated with the recessional, which was Bach’s Great Fugue in A minor. My grandmother had played its piano transcription at her London Debut at Wigmore Hall in 1937. Although the Parish organ wasn’t the Sydney Town Hall’s, the music truly was incredible, even ethereal. Not unsurprisingly, 5 year old Mister was captivated by the organ and was just the sort of kid, funeral or no funeral, who would start tinkering on the keys. Afterwards, seeing his interest, the organist casually started talking to him, asking him whether he plays the piano. Given my grandmother’s career and reputation, I’m sure this was more along the lines of learning the piano. Mister, who couldn’t sit still and hadn’t had any formal lessons replies: “Yes”. After all, at this point of time, he could do a fabulous imitation of someone playing the piano. He’d stick the music up and move his hands around the keyboard with almost professional skill without playing any notes. Sure, he might have showed a strong Liberace influence but he really did do an exceptional job. However, contrary to his great ideas, that’s not actually “playing the piano”. Anyway, his conversation with the organist is deepening and I was starting to feel just a little concerned. “Would you like to play?” asks the organist. Now, his father and I start choking, almost dying on the spot thinking about Mister letting loose on the mighty organ. As a 5 year old boy who made wild horses look restrained, anything could happen. I could just imagine all the mourners leaping out of their skin as the mighty organ let out some kind of almighty scream as it reacted to his touch. Under the circumstances, it wouldn’t have surprised me at all if my dear grandmother had leaped out of her coffin and whacked him over the knuckles with both walking sticks. 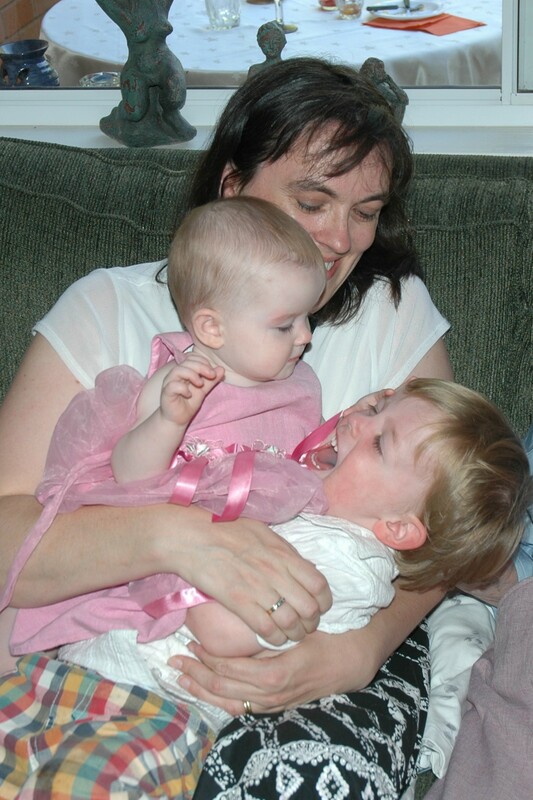 Not that she’d actually do something like that but I do remember her feeling justifiably “concerned” when we were taking the obligatory Christmas photos and the kids were rather rambunctious. This photo was taken at Christmas Day 2006 right next to my poor Gran. You can see the edge of her skirt but I’ve respected her privacy. However, in what was possibly the greatest surprise of his early years, Mister mysteriously declined the offer. It seemed that somewhere, deep inside our young man there was some discernment. This was the very same little boy who usually bolted in where angels (and the much more tentative Miss) feared to tread. Perhaps, my grandmother did tap him on the shoulder after all. Mister took my grandmother’s obituary into class for news. Whiteboards in classrooms were quite a novelty at the time and it was so exciting that we could beam her obituary onto the screen. I must say I find the title rather sexist and offensive. Made her sound like a washer-woman….humph! This entry was posted in music, Parenting and tagged Auden, Eunice Gardiner, family, Funeral Blues, funerals, grief, humour, music, organ, organist, parenting, pianist, Tagore on September 3, 2015 by Rowena. 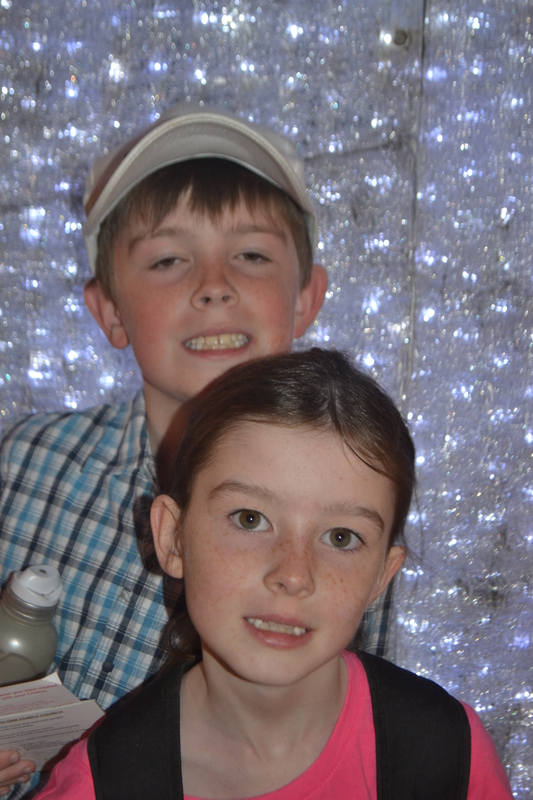 Sunday night before last, our 8 year old daughter “Miss” sang in a multi-school choir at the Sydney Town Hall. Celebration Sing Out was a concert supporting the Music Therapy Unit at the Children’s Hospital at Westmead, Sydney. Celebration Sing Out, Sydney Town Hall. As much as we might have believed in the cause, let’s be honest. All the parents, grandparents and the rest of the royal entourage were there with only one thing in mind…to see their little darling up on stage at the Sydney Town Hall. Our brilliant, shining little stars had us all transfixed in their orbit. 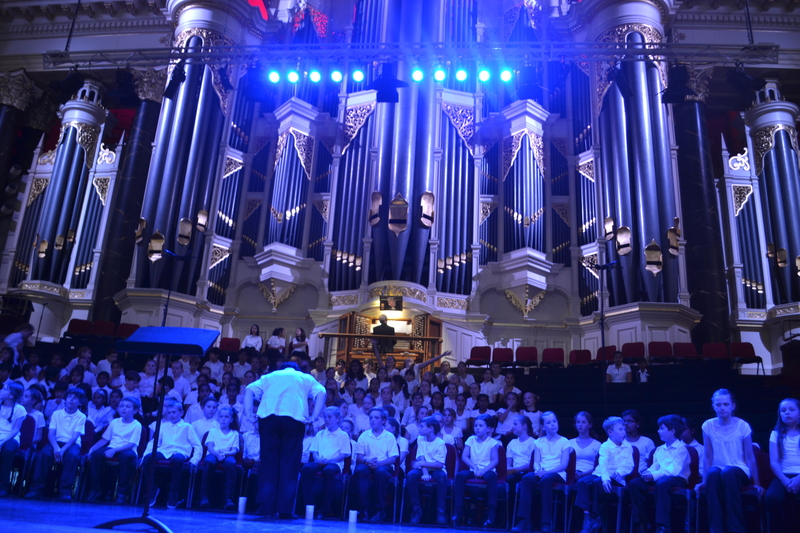 It might not have been the Opera House but singing at the Sydney Town Hall is still a big deal and a very imposing, impressive venue with the huge pipe organ towering overhead. When the organ was completed in 1890, it was the biggest pipe organ in the world. That’s not bad for a former convict town. How have to admit this gig was pretty impressive and the children sang like angels as well! While our little darlings might have been just one of hundreds all not-quite perfectly cloned in plain white shirts and black pants, we didn’t care. We zoomed in and picked out little star out of the multitude and stared at them transfixed with love and pride. Christmas came early…the kids checking out the Christmas lights in Sydney’s Queen Victoria Building on the way to dinner. A key component of this parental pride was getting a good seat so we could not only spot our darling among the multitude but also to get a good vantage point to take photos. Unlike many public events where you are not allowed to use cameras let alone photograph or film children, this event was a paparazzi free-for-all. While the kids and I went to check out the David Jones Christmas Windows and have dinner in Hyde Park, Geoff sat in the queue to get our seats. He had left for work at 4.30am and was happy to mind the seats. You get my drift. Before the concert began, I was down the front and after scanning the crowd several times, eventually I spotted Miss in the jungle. Many of the kids were waving out to the crowd and getting rather excited. However, Miss didn’t respond to me at all. I was pretty hard to miss. What started out as something like a dignified, royal wave became more frenetic as she absolutely failed to respond. She didn’t smile or even blink in my direction. Not one to be ignored, I’m waving both arms by now and doing everything but screaming “cooee” above the hubbub. I decided I wasn’t going anywhere until she responded. She might have been up towards the back but I was standing right in front of her waving my arms, taking photos with the standout Nikon SLR camera (something with a real lens not one of these Mickey Mouse phone cameras). I mean… I really stood out. It was almost like I was standing there with two heads and still she refused to acknowledge my existence. Eventually, finally, at a point no doubt verging on terminal embarrassment, she waved back. Relief! She later told me that she’s not supposed to wave. You see, at 8 years of age, she’s already the consummate stage professional! Naturally, I wasn’t the only paparazzi in sight. As I scanned around the audience, there was an array of camera phones sticking up above the audience like the sort of TV antennas you see in regional towns desperately trying to pick up the city stations. The singing was absolutely beautiful and a real tribute to everyone involved. 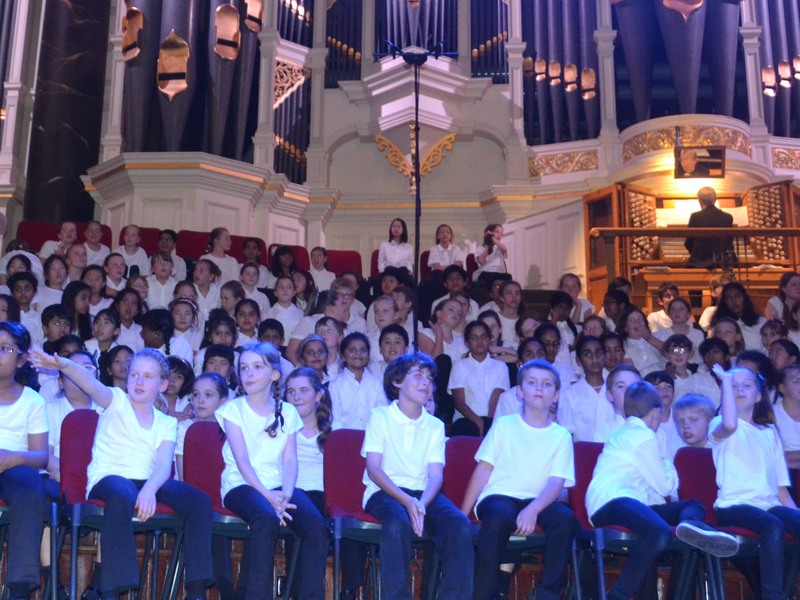 The children sang beautifully in unison and sat still for considerable periods on stage during other performances. The concert began at 7.00PM concluding at 9.30 which is well past many of their bedtimes and yet they were the consummate performers…real little professionals. While this performance was mostly about our daughter, there was also a ghost in the room…my grandmother. 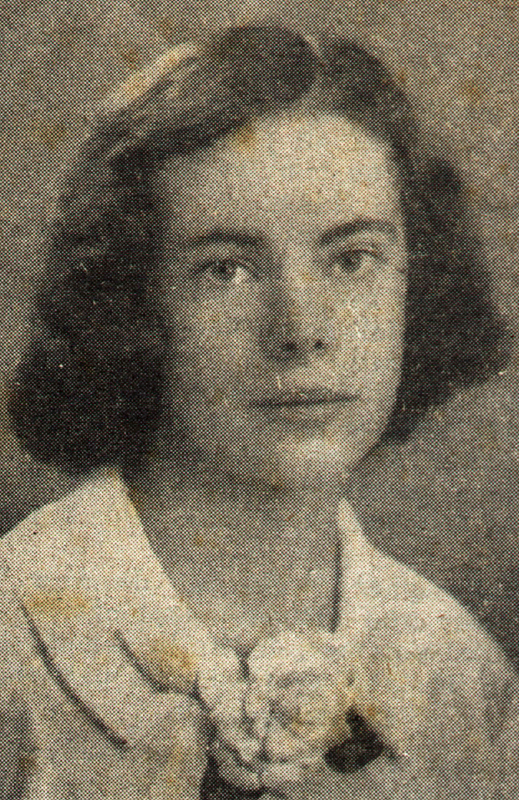 Hard to believe my grandmother was ever a 15 year old schoolgirl. She, on the other hand, didn’t recognise the old lady staring back at her in the mirror. I now understand what she meant! My grandmother, Eunice Gardiner, was an internationally successful concert pianist, music critic and piano teacher at the Sydney Conservatorium. Eunice was taking up a 2 year scholarship at the Royal Academy of Music in London. A fundraising committee had been formed to raise funds towards her living expenses in London. 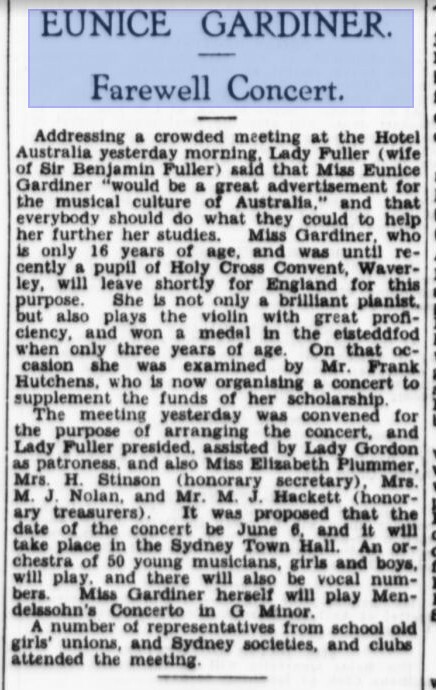 As part of these fundraising efforts, Eunice gave a concert at the Sydney Town Hall on the 6th June, 1935. This is a story I grew up with and I remember my grandmother showing me her precious newspaper clippings in her seemingly ancient scrapbook. This wasn’t something we looked at often…only once or twice in my life time and indeed while working on her memoirs, she even let me take it home for awhile to scan. Talk about precious cargo. This was back in the days before the old newspapers had been uploaded onto the Internet and you couldn’t just summon up someone’s entire life history with an instant and exceptionally gratifying Google search. 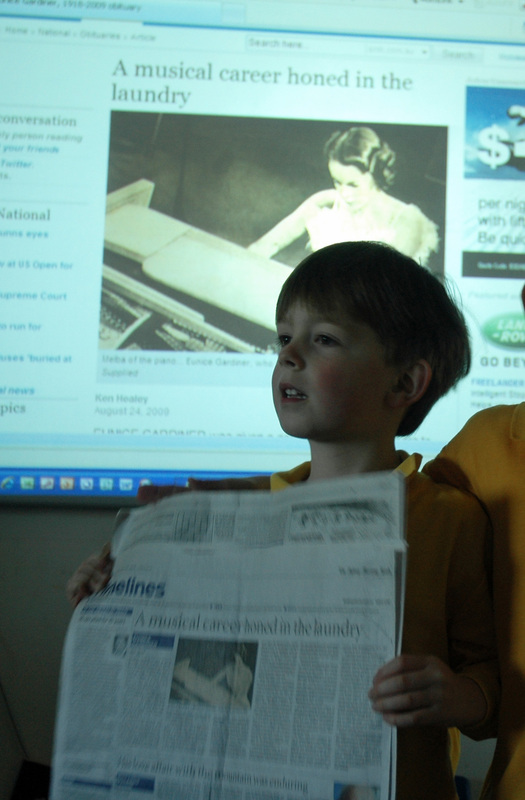 Of course, you could look at the old newspapers on reels at the State Library but you needed to do your research first. It was a tedious, laborious process. So these press clippings and particularly her scrap book, were incredibly precious!! Anyway, as we arrived at Town Hall, I was no longer viewing my grandmother’s concert as an ancient black & white newspaper clipping but as a living, breathing experience. I was walking up Town Hall Steps with her parents and brother, Les. I could feel their pride bursting through my heart and saw it reflected back to me as our daughter sang up on stage, enjoying the whole experience. This was not necessarily going to be a given. Singing in front of 1000 can be daunting if not terrifying but it seems that being part of a crowd can be a good thing. Once upon a time, when I was a little girl, I’d had my own piano performance. However, it was hardly at the Sydney Town Hall but in a hall hired by my piano teacher in Wahroonga, a Sydney suburb quite a long way from the Sydney Town Hall both in terms of kilometres and kudos. While it was a big thing for me to be performing at the concert and I had practiced pretty hard and knew my piece from memory, the fact that my grandmother was attending the concert was a big deal. I distinctly remember getting in the car and Mum asking me if I had my music. I told her that I didn’t need it…that I knew my piece from memory. I was a confident little kid and not easily intimidated. I didn’t need my music and I was going to do it my way despite my mother’s concerns. Well, of course, I got up on stage my legs dangling from the piano seat and of course I lost my place. I remember this terrible sinking feeling in the pit of my stomach. Mum had seen it coming and I’d botched it. Plus, my grandmother was watching. I’d been to see her perform at the Sydney Opera House wearing my very best dress which she’d brought back from me from Norfolk Island and where I couldn’t cough, sneeze, go to the toilet and if you sat very, very still, you were actually permitted to breathe. My grandmother wasn’t one of those grannies who give you Freddo Frogs (https://www.cadbury.com.au/Products/Pre-teens-Confectionery/Freddo.aspx) either . She was in some sort of inter-stellar zone us mortals could only watch from the outside. I can almost feel myself stop breathing yet I persevere and tinkered with the keys until I found my place and kept going…my pride wounded but undefeated. I am so proud of that little girl who didn’t just burst into tears and exit stage left..It might not have been a perfect performance but I persevered and I conquered. Actually, perhaps the last word on that concert should go to my grandmother. When she reflected on this concert in later life, she mentioned nothing about the epic stumble during my performance. Rather, she tell me that she’d got in trouble with my Dad for disciplining my brother during the concert. That’s right. She’d got in trouble. You know I’m smiling! Meanwhile, as the end of the year approaches, our daughter’s ballet and jazz concerts lie ahead and I’m practicing for my violin concert. Well, like our daughter I’m part of a group and there will be no solo performance. This is certainly one time I don’t want to stand out and for once in my life, just be one of the crowd. And I’ll be taking my music! 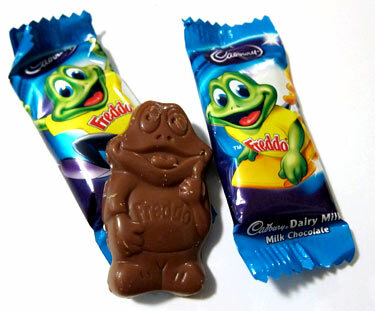 Introducing Australia’s very own Freddo Frog. This entry was posted in Parenting, Violin and tagged Australia, Celebration Sing Out, choir, choral, Eunice Gardiner, family history, grandma, grandparents, granparents, history, kids, mom, mum, music, music therapy, Nana, organ, parenting, pianist, school, school choir, Sydney, Sydney Conservatorium, Sydney Town Hall on November 18, 2014 by Rowena.